Marla Allison’s “Evening Clouds” at Singular Couture. Santa Fe, N.M. — Friday at Indian Market, the streets around the Plaza shut down as artists begin preparing their booths. At the Convention Center, winners of the art show are announced, and everyone shares the news as it filters out. Meanwhile, panels and films, demonstrations, receptions, and openings continue in galleries all over town. I began my afternoon at Singular Couture‘s opening of their Native Voices group show. Indigenous designers including Marla Allison (Laguna), Anthony Gchachu (Zuni), Lorne Honyumptewa (Hopi), Michael Namingha (Hopi), David Naranjo (Santa Clara), and Shelley Patrick (Muscogee) were featured for Market Week. Singular Couture hires diverse artists from across the country to paint their silk jackets, but owner Sarah Nolan said she deliberately seeks Indigenous artists for their unique style. Shelley Patrick with two of her jackets at Singular Couture. The relaxing rooms of Niman Fine Art were my next stop. The sophisticated work of Dan, Michael, and Arlo Namingha is showcased there. I arrived before the night’s opening, so I had a chance to look at the paintings and sculptures before the crowds arrived and visit with Michael and Arlo. “Cloud Over Hopi Butte” by Dan Namingha (Hopi-Tewa) at Niman Fine Art. Next, I dropped by King Galleries for the opening of New Works in Clay featuring work by Nathan Youngblood, Tammy Garcia, Les Namingha, Susan Folwell, Juan de la Cruz, Al Qöyawayma, Virgil Ortiz, Steve Lucas, and Daniel Begay. I spoke with Juan de la Cruz, whose work is not only new to the gallery but somewhat new to the artist. Until a year and a half ago, de la Cruz was a watercolorist. His mother suggested that he transfer his delicate works to clay, and tonight, he showed them at King Galleries. “Parrot Girl” storage jar by Juan de la Cruz at King Galleries. Blind Archer Lights 2180 by Virgil Ortiz at King Galleries. Parading of Pots at Andrea Fisher Gallery. A closer look after the Parade of Pots at Andrea Fisher Gallery. Next, I walked to the other end of the Plaza to see Shinnecock ceramicist Courtney Leonard’s work at Ellsworth Gallery. 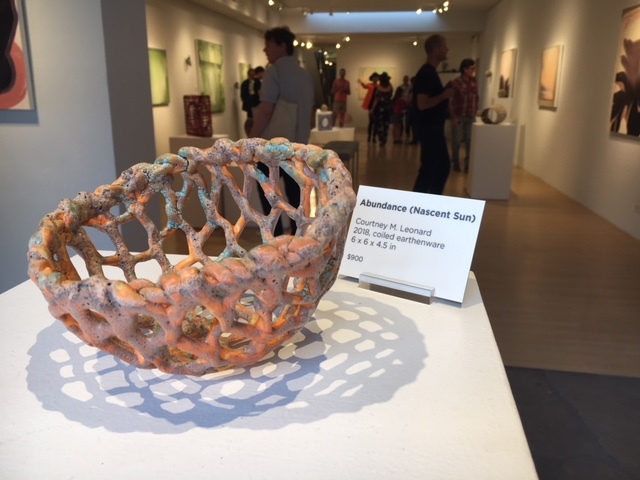 Leonard exhibited alongside painter Amie LeGette in a show titled Nascent Atmospheres. Leonard is part of Matthew Ryan Smith’s feature article “Clay Cultures and Muddy Waters: Northeastern Woodland Ceramics” in the current issue of FAAM. Abundance (Nascent Sun) by Courtney Leonard at Ellsworth Gallery. I was also glad to see some of Winnebago/Mississippi Band Choctaw painter Chaz John’s Rez Dogs Redux in the back of the gallery because I had covered the original show for FAAM back when the paintings were hung at dog-height for the canine art aficionados who were invited to its opening. The paintings are now at human-height and will be up until August 26. Chaz John’s “Rez Dog Mother with Bingo Sheet” at Ellsworth Gallery. Finally, I walked to Peters Projects, where Will Wilson’s Photosynthesis and Calabaza & Clark’s Walking in Beauty exhibitions were opening. I barely made it in time, but I’m so glad I did. In addition to the two new exhibitions, the gallery still has Cara Romero’s Everywhen: Indigenous Landscapes (until Aug. 25) and QUADRIVUM: Four Native Artists (until Aug. 25) featuring large works by Darren Vigil Gray, Tony Abeyta, Mateo Romero, and Patrick Dean Hubbell. Yatika Fields (Muscogee-Osage-Cherokee) checking out photography by Will Wilson (Diné) photography at Peters Projects. Work by Carl and Irene Clark (both Navajo) at Peters Projects. I rushed back across town, still on foot, to the convention center to meet up with my family and see their pieces in the show, to visit with all the people I knew there, and, of course, to look at the incredible art that is always a part of the Indian Market show. Early in the morning, I’ll help set up the family booths, and then I’ll walk all over town again to see what I can see, who I can visit, and what I can learn. That’s what Indian Market is all about!